Leon Cooperman: "The Whole Structure Of The Market Is Broken"
In a wide-ranging interview on CNBC, Leon Cooperman, chairman and CEO of Omega Advisors, explained that he doe snot see the market as 'cheap' or 'expensive' currently but warns that traditional value-manager-driven strategies face difficulties because " all these quantitative trading systems are destroying the structure of the market...particularly that group that buy strength and sells weakness." 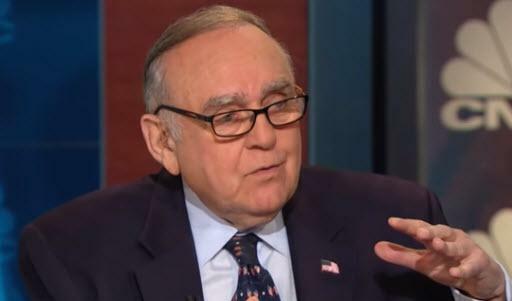 Cooperman goes on to reflect on last week's mini-crash as being overdone, because "credit was relatively flat" but warns that "It’s crazy...selling begets selling because of these quantitative trading systems," adding that he thinks "all this fixation and fear about interest rates is misplaced." However, he does warn that "the strongest economy in 50 years" could be a problem as "it forces the hand of The Fed." Who knows. I mean basically I think that the whole structure of the market is broken. You know when I came into the let’s put it this way. Whatever success I’ve achieved I think I’ve achieved it because I’ve been very lucky. I have a common sense basically. And I have a strong work ethic. And this whole thing now with all these quantitative trading systems are destroying the structure of the market you know particularly that group that buy strength and sells weakness. So, everyone I know that’s accumulated wealth, whether it’s Warren Buffett, Ken Langone, Mario Gabelli - all friends of mine - I think they made their fortunes that by buying weakness and selling strength. What’s happening now [with the algos] is they’re trend followers and they really are exaggerating the trends up and down. The condition is that normally call for a significant market decline are just simply not present. It’s crazy...selling begets selling because of these quantitative trading systems. But basically as I said a moment ago the conditions that normally lead to a big decline aren’t present... you know the high yield market sold of 2 percent when the S&P was down 8 percent, the overall credit market was relatively flat. So you know I think I sent you a couple of slides to make my points. And we’ll get to him. Basically the things I look at which suggest that the market is OK is not cheap but it’s not expensive you know it’s not an exciting message when I tell you the markets in a zone of fair valuation. Basically it doesn’t excite you but that’s kind of where we’re at. This is the end of a 10 year government bond adjusted for (minus) the CPI and the shaded areas on the chart or past recessions and bear markets. And the message is abundantly clear. Real interest rates for five, six, seven, eight, nine hundred basis points prior to the bear market and recessions of the past. Real interest rates today are zero. The Fed has been extraordinarily accommodative. So you know the market can easily handle the rise in interest rates as long as the slope of the rise is gradual. I’ll give you some statistics - I don’t make it sound like a statistician - but basically the last 50 years, the S&P multiple averaged 15 times; when it averaged 15 times, the 10 year government with 6.65% and a 90 day bill was 4.95%. Today the multiple on the market is about 16.5 times earnings - so 10% above the historical norm - but the 10 year government is about 3.1% vs 6.65%, and treasuries bills are a little over 2% versus 4.95%. The market will allow for a rise in rates; in fact I think the rise in may be more positive than negative. The pricing structure in the market allows for a rise in rates. The condition that normally lead to a big decline... What are they? Recession. OK. There’s no signs of recession the economy if anything is too strong the economy is on fire. I was at a board meeting two weeks ago and the head of the Association made a comment that in 50 years of being in business he has never seen the economy as strong as it is today. That probably in my opinion is probably a problem because it’s going to force the hand of the Fed. The economy is very strong, so the recession is not on the horizon. A hostile Fed is not on the horizon ( look at the chart above that said real interest rates are zero), so that’s not a restraining influence on the economy. So the condition that normally lead to a big decline are simply not present.